You’ve pinched pennies, saved funds, watched hours of home improvement shows, and combed the aisles of your local hardware store for the perfect fixtures. You’re ready for the kitchen remodel of your dreams for your Brooklyn home. But are you sure you’re ready? And have you thought about more than new cabinets and drawer pulls? 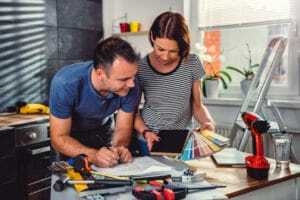 Home improvement can be fun and rewarding, but there are elements to a kitchen remodel that might be tough to remember. Issues like plumbing and natural gas lines should also factor into your plans. At Petri Plumbing & Heating, we enjoy helping our Brooklyn neighbors get the kitchens of their dreams. DIY is great, but before you go full force with a kitchen remodel, consider these often-overlooked problems that might arise. How old are your home’s pipes, and how long has it been since you had them inspected? If you’re dealing with an older home, it’s a good bet your pipes have seen better days. The last thing you want is to sink a lot of money into a kitchen remodel, only to have a pipe burst and ruin it all. If you’re altering the layout of your kitchen, you need to take plumbing into account for your sink and appliances. Your sink needs hot and cold water and drainage, and so does your dishwasher. Your refrigerator also needs access to water. Is your new layout worth the cost of moving utilities? Consult a professional plumber before setting your plan in stone. 3. What About Natural Gas? Are you thinking about switching from electric appliances to natural gas? These appliances heat quickly and are energy-efficient, but they also need access to gas lines to function. Don’t attempt to install or move natural gas appliances on your own or change the location of your gas hookups on your own. These changes should only be undertaken by experienced, licensed professionals, or you’re risking dangerous gas or carbon monoxide leaks that could endanger your life and property. So, while you’re picking out countertops and faucets, take some time to call Petri Plumbing & Heating. Our expertise in plumbing and natural gas can give you the quality, functional kitchen of your dreams while protecting you from kitchen disasters. Call (718) 748-1254 or contact us online today!